Thongdok urge upon party leaders to work with more zeal for the welfare of people . 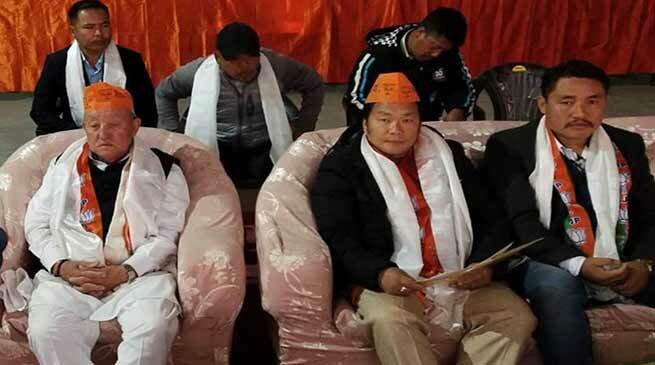 The extended meeting of BJP Kalaktang Mandal Unit held here at Shergaon on Monday which was attend by the several leaders of all wings and level of the 5 Kalaktang Assembly Constituency and West Kameng district. Attending the party extended meeting local legislature Tenzin Norbu Thongdok spoke on the need of strengthening the party leaders. Elaborated several welfare activities and flagship programme of government for the welfare of people. He urge upon the part cadres to work with more renowned zeal for the welfare of the people. President BJP West Kameng District unit Sambu Siongju, President of BJP 5th kalaktang Assembly constituency Pema Rinchin also address the meeting and discussed various issue of the party activities and programme.